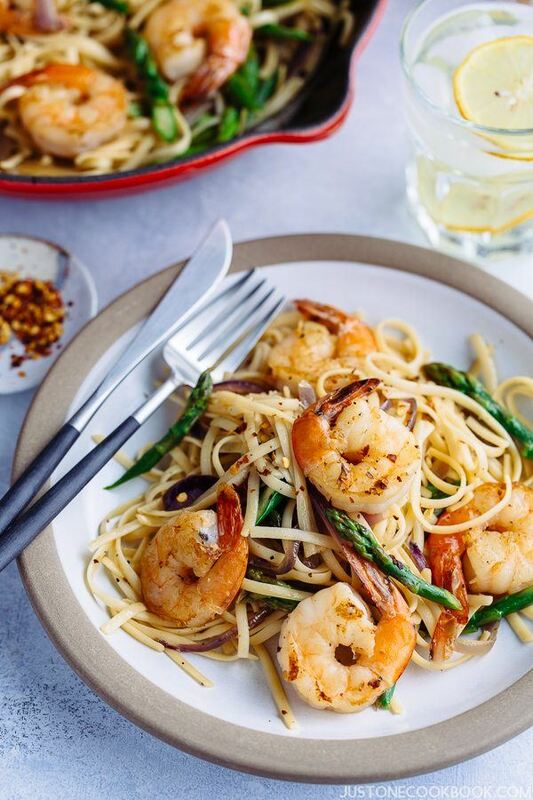 This Japanese-style wafu pasta with shrimp and asparagus is seasoned with soy sauce and flavorful dashi broth. You can make it in less than 30 minutes and it’s also gluten free! Spring is in the air! 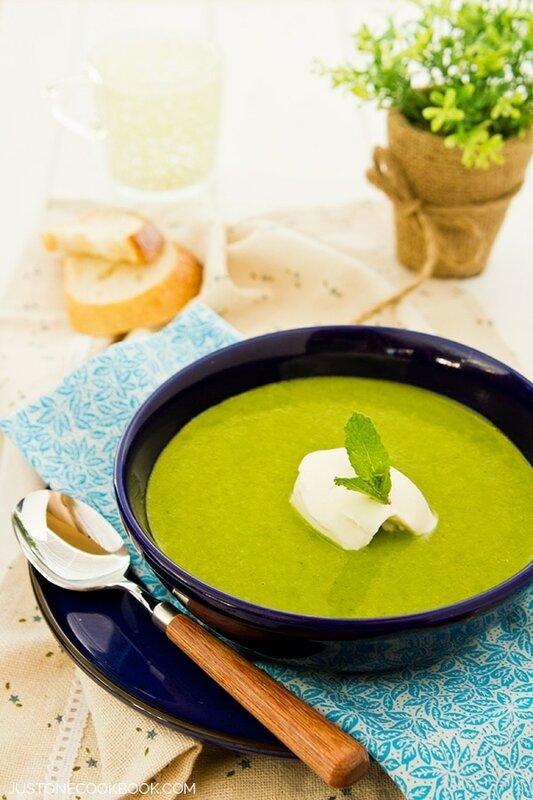 Say goodbye to hot pot and stews, and let’s welcome bright and light dishes with spring vegetable! 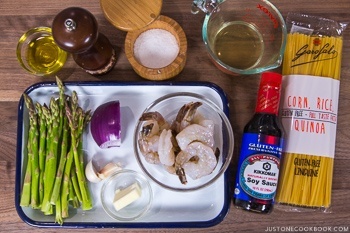 Today I’m going to share a super quick and easy Japanese-style Wafu Pasta with Shrimp and Asparagus (海老とアスパラガス簡単和風パスタ). Some of you probably heard of the word “Wafu Pasta” but it’s a term that’s usually heard only in Japan. What does it mean? Wafu (和風) means Japanese-style. and we often use this word to describe somethings that’s Japanese style (e.g. salad dressing). In today’s case, we’re making a western pasta dish into Japanese style. 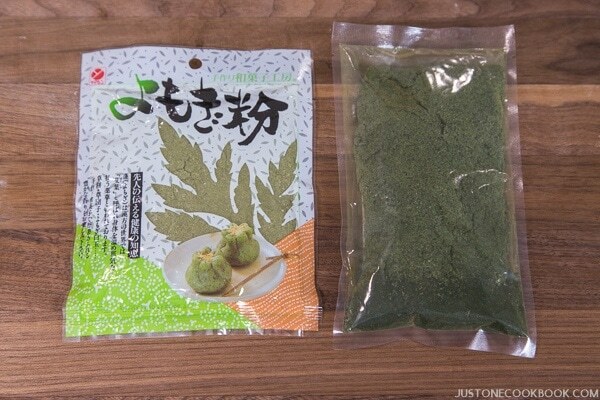 You might also have heard of Wafu Hambagu, which I shared on the blog in the past. Basically, traditional hamburger steak but made with Japanese style in terms of flavors, ingredients etc. 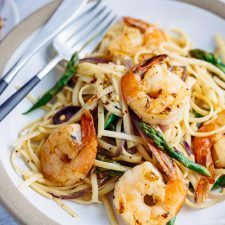 There are so many wonderful spring vegetables that you can incorporate into this dish in case you don’t like asparagus. Here are my choices of spring vegetables that would go well with this dish. Asparagus is very sweet and delicious when it’s in season! You should look for firm and crisp stalks with tight closed budding tips. There are different sizes of asparagus, and for this recipe I think it’s best to pick thin to medium-width stalks so that they don’t require cooking for a long time. 2. Cook stalks and spears separately. The texture of the food is important, especially when you want to fully enjoy seasonal fresh vegetables. You don’t want to get mushy wilted asparagus! In cooking, little extra steps help and improve the final dish. Please remember to cook stalks first because they take a longer time to cook than spears. 3. Cook pasta till al dente in the fry pan. Don’t cook your pasta until al dente when you are boiling pasta in the pot, as you will need to toss the pasta with ingredients and seasonings in the fry pan. You don’t want to end up with overcooked pasta. Purposely undercook the pasta for this dish. Yes or No for Chili Peppers? Mr. JOC and I love adding 1-2 dried red chili peppers (without seeds) in this pasta. I’d chop into smaller pieces and cook with olive oil and garlic to infuse the flavor. However, my children think it’s a bit too spicy, even with one red chili pepper. If you have children, another option is to sprinkle crushed chili peppers over pasta at the table. As the chili peppers are not infused into the oil, you would need more chili flakes to enjoy the kick, but it works. If you love spicy food, I highly recommend cooking with chili peppers. 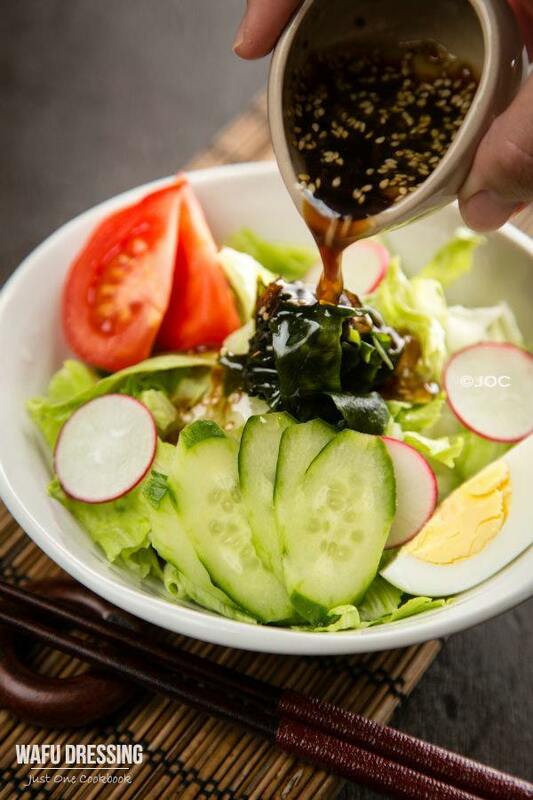 Soy sauce is traditionally brewed from water, wheat, soybeans and salt. If you are gluten intolerant, you won’t be able to use soy sauce in cooking unless it’s tamari soy sauce (100% wheat free ones) or gluten free soy sauce. 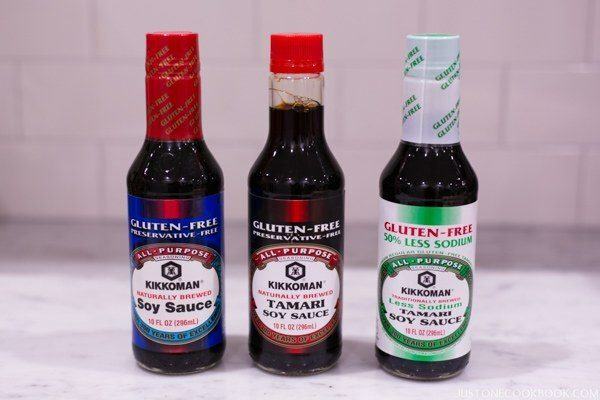 Kikkoman offers 3 varieties of gluten-free soy sauce. 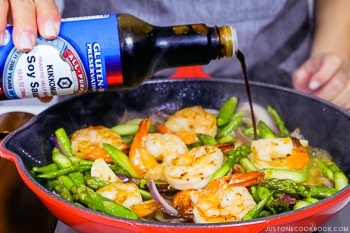 For this recipe, I used the regular gluten-free soy sauce (blue label) which tastes just like regular soy sauce. 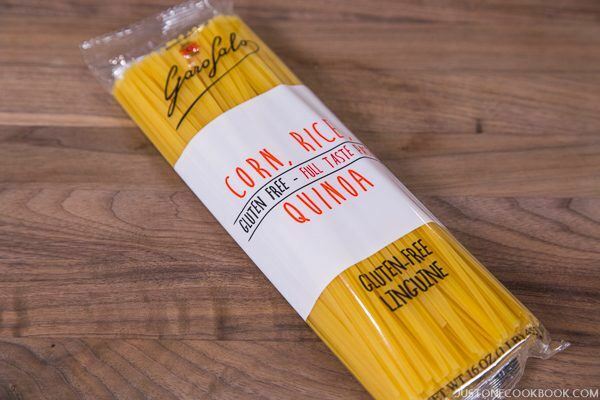 I’ve tried several brands of gluten free pasta and by far Garofalo’s Gluten-Free Spaghetti and Linguine are the BEST pasta that I’ve tasted. The texture and flavors are just like regular pasta. Mr. JOC and the kids didn’t notice that this was a gluten free dish until I mentioned it. So if you have a family member or friend who is allergic to gluten, you can all still enjoy the same meal with this pasta! If you’re gluten intolerant, check out my Gluten Free Recipes for additional recipe ideas. Gather all the ingredients and bring a big pot of water to boil. Meanwhile cut red onion and garlic cloves into thin slices. Cut asparagus diagonally and separate spears and stalks, we will sauté asparagus stalks first as they take longer to cook. Sprinkle kosher salt and freshly ground black pepper on prawn. If your prawn is not peeled or deveined, you can check my tutorial for instructions. Once the pasta water is boiling, for 4QT (16 cups or 3.8L) add 2 Tbsp salt. As we will cook the pasta a little longer after draining, cook it 1 minute less than the directions on the package. Heat 1 Tbsp olive oil in a large skillet over medium heat. When it’s hot, add prawn and cook until the bottom side is nicely browned, about 2-3 minutes. Don’t touch the shrimp until it releases itself from the skillet. Once it has nice char on one side, you can easily flip. When the one side of the shrimp is nicely browned, flip and cook the other side for 2-3 minutes. Once the shrimp are nicely golden brown, transfer to a plate and set aside. Lower the heat to medium low, add the butter and swirl around. Add the red onion and garlic slices and sauté for 1 minute. If you like spicy pasta, add chili pepper now. Increase the heat to medium and add the stalks of asparagus. Sauté for about 3 minutes, until asparagus stalks become tender. Then add the spears of asparagus and cook for another 1-2 minutes, until the asparagus are tender but still nice and crisp. Add the prawn back in to the skillet and increase the heat to medium high heat. Add dashi. Add gluten free soy sauce and adjust based on your preference. Add the cooked pasta and toss to combine with the ingredients. If you like, sprinkle freshly ground black pepper. Serve immediately. Optionally, you can garnish with chili pepper flake. Well, Nami, I have learnt a new word . . . and this easy-to-make fusion pasta promises to be very tasty indeed! As a doctor and nutritionist may I suggest tho’ that each would-be-cook reads up a little about gluten – less than 1% of the population needs to be gluten-free and avoiding foods containing gluten without reason can actually be very harmful to one’s health in a multiplicity of ways!! So: for me at least proper pasta and real soy sauce 🙂 ! It’s true that around here (In California), we have a lot of restaurants and shops that serve gluten free foods. But in my kids’ class and among our friends, there are people who suffer from celiac disease who can’t eat gluten. I feel like every year since I started blogging, more and more people emailed me about their new finding about their gluten intolerance. Luckily, our family can still enjoy glutens and we don’t have to change our dieting, but it must be very difficult to make adjustment for those who need to do that as a family. It’s good that some brands produce products that taste same as regular one, like this pasta and soy sauce, so the rest of family can enjoy the same food together. dearHeart – sorry to have brought this up at all, but as a professional I kind’of have an obligation 🙂 ! In Australia very many people do not understand the seriousness of their ‘fashionable’ choice I am afraid! Pay more money and cause harm. As far as ease of family meals is concerned: if one person out of a family of four is coeliac does that mean the other three should cause possible harm to themselves? It is easy enough to make adjustments to meals to accommodate the person with the ailment. Unfortunately the more people talk about this the more unhappy and oft neurotic persons think this is what is making them ill: without doctors or tests! Amen!! Hi Eha! I think gluten-free diet shouldn’t be something that anyone should do casually. It’s easier when the whole family is gluten-free, because you’re making only one version of every meal, as opposed to two. And not to mention, there is much less risk of contaminating! And psychologically it’s nice to eat the same meal together as an entire family. However, I totally agree about the risk of lack of nutritions deficiencies (I learned vitamin B, calcium, etc). I think going to 100% gluten free WITHOUT genuinely having celiac disease or gluten sensitivity doesn’t make sense (esp for those who do it for the sake of “trendy dieting”). Over all, those who don’t suffer from gluten shouldn’t eat GF foods unless there is no need to. I believe some occasional GF meals with family should be fine… for the sake of one family meal. People could choose a worse choice such as fast food or less nutritious food or no-carb diet (bread/pasta etc). So happy to hear that! Thank you for your kind feedback, Lyn! I’ve been buying gluten-free soy sauce simply because we sometimes cook for friends who can’t tolerate gluten. Can’t distinguish the taste between soy sauce that contains gluten and that doesn’t! Anyway, we’re starting to get in the mood for lighter dishes, too. This looks wonderful! Gorgeous photos, too. Thanks! Thank you for the wafu pasta recipe. I always wanted to learn but can’t find where to learn.I remember the japanese restaurant WARAKU that sells wafu pasta. normal shoyu like YAMASA or Kikkoman? 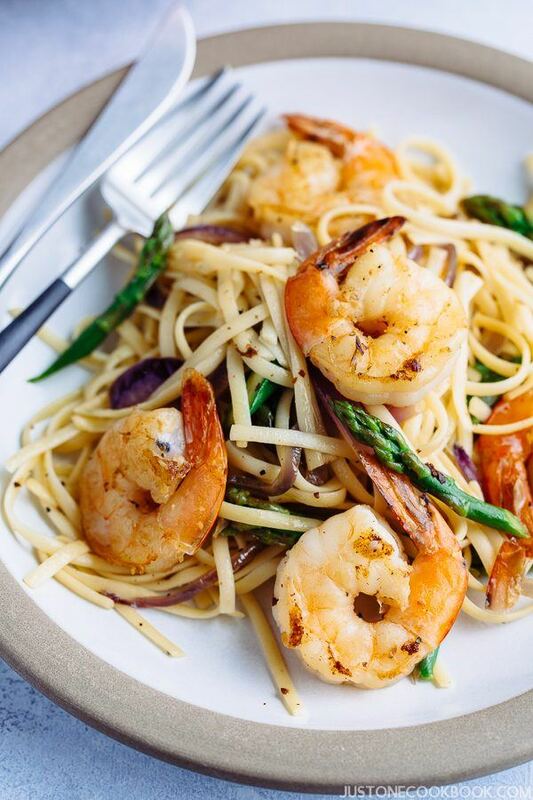 Hey Nami, greetings from germany your recipe is great, love the combination of asparagus and prawn. I have a littel question, what is the brand of your flatware shown in the picture? Thank you for the recipe. My mom has a slight allergy to gluten and wants to not eat gluten at all and is trying to push the rest of the family into not eating gluten. I keep telling her that going completely off gluten can make people become completely intolerant to it, but she won’t listen. Apparently theirs a genetic company in the US (forgot the name) that has altered the wheat so that it is more resistant to bugs. Since then had led to a rise is people reacting not only physically but also some people getting chemical imbalances as well in their brain. I’ve had some friends who are Aspergers and their problems lessen without gluten in their diet. A side note, I’ve seen you cook with these little measurement ingredient holders. where do you get them, as none of the cooking stores in my area carry them. Hi Erin! I heard about that too. We didn’t have this issue before but nowadays a lot of people suffer and I feel bad for those who have bad food allergy. 🙁 The part that I worry is that it can happen to anyone all the sudden (not born with it). It must be a relief for some people who found out less or no gluten helps their condition. I have a friend who is testing gluten free diet now to see if that helps her health condition. And I always think about the family who eat meals together. I was happy to find companies who make gluten free products that are almost same as regular products. I’ve tried different GF pastas and unfortunately they weren’t tasty. I was so happy when I found this pasta brand. Kikkoman’s soy sauce is great too! I’m not sure which measurement holders, but do you see them in my shop page? If not, let me know. I’ll be happy to share what I use. I only saw the 9 piece bowl set. What I’m looking for are small containers that hold ingredients after you measure them. That way you don’t have to make a mess trying to measure ingredients as you cook while you hurry to get the nest step in. I have some 2 cup sized metal bowls and a couple tiny porcelain dishes, but It would be easier to have small containers, maybe plastic or sturdy glass that wouldn’t be so fragile. Also when you mix liquids and sugar into a small bowl, the sugar melts and sticks to the bowl. Hi Erin! Now I know which one you’re talking about. I use this glass bowl. It’s about 2.5 inch diameter. I premeasure soy sauce etc in here. It’s great for one ingredient, and keeps about 2 oz. I only use it for my blog/youtube channel and I don’t use this size for my personal use. For personal use, I recommend a slightly bigger size for mixing. Hello Nami, long time no see! Sorry i have not been leaving comments on your blog, though I have been following it closely. Simple, versatile and healthy recipe, Nami! I had a salmon fillet that I had already planned to cook for dinner and decided to substitute it for the shrimp and the pasta turned out great. Looking forward to trying it next with shrimp. Thanks for sharing! 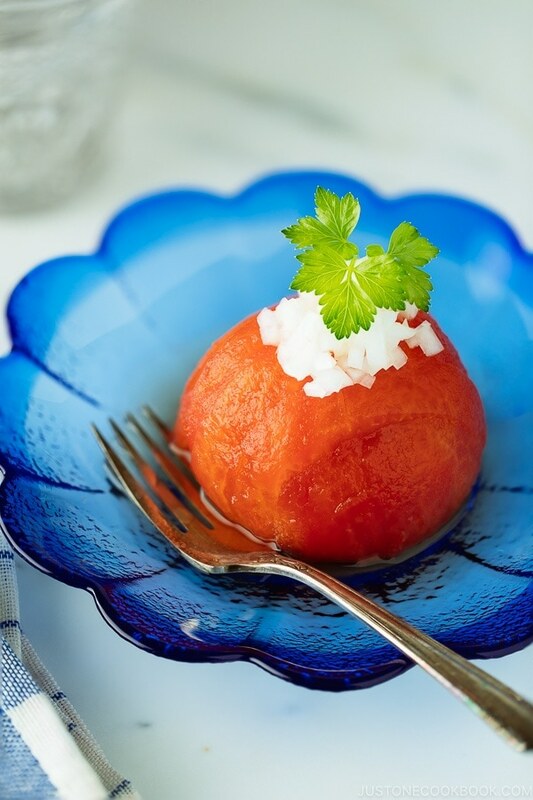 Hi Nami – This recipe was delicious! So simple yet so tasty. 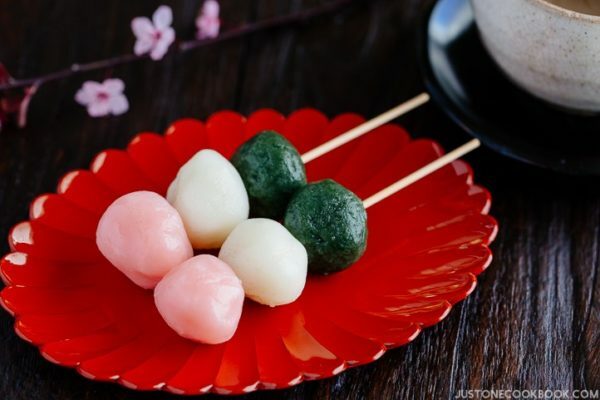 I love Wafu recipes – they remind me so much of the cafes in Japan. 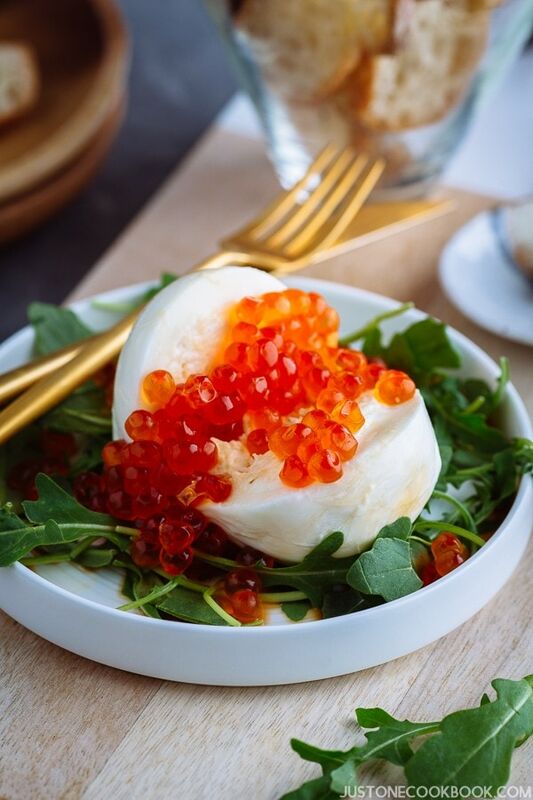 Thank you for posting this awesome recipe – my family and I really enjoyed it. 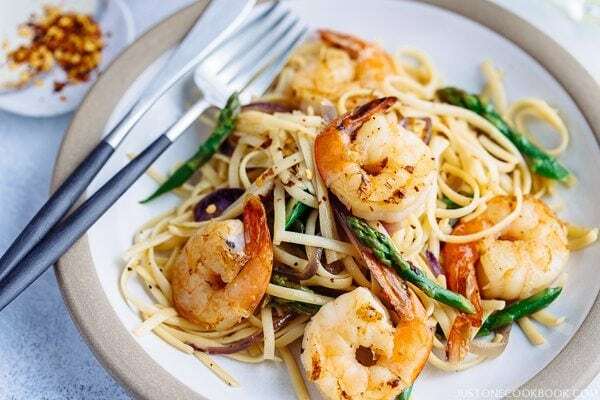 Hi Nami, What do you recommend as substitute for shrimp given the taste combination of asparagus and seasoning? Should i go vegetarian completely since meat may make the dish too heavy? Additionally, how would you cut Belgian Endive and for how long to cook it in the heat? Thank you so much in advance for advice. Belgian endive – assuming you’re talking about for a different dish?? Now, don’t separate them. Depending on its size, cut in half or quarter (wedges). So the core will hold each piece. They can be enjoyed raw, so just cook for 2-3 mins. I love crisp texture, but depending on the dish you’re creating, maybe more toward 3 mins so it’s not as crisp and balance out with other food texture. Hope that helps a little…. Hi there what to do with the dashi? Great recipe. We ate it last night. I did substitute Somen noodles for Pasta. Like those & Udon noodles a lot. I would ask you to use more metric weight measurements than volume. P.S. I include a metric system in parenthesis (except for the recipes from 5-7 years ago, which I haven’t updated). 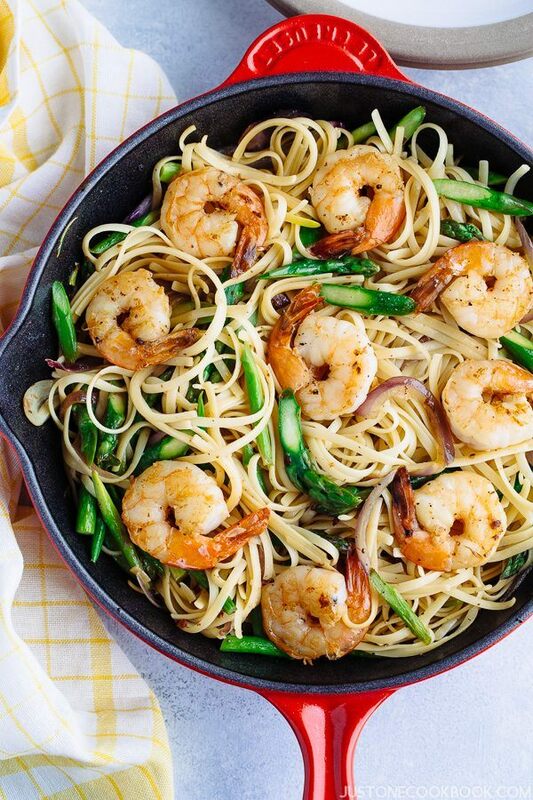 Hi Nami, what skillet and size did you use for this dish? Thanks! Absolute FAVORITE!!! The Japanese Dashi really brought out the flavor and made this outstanding. 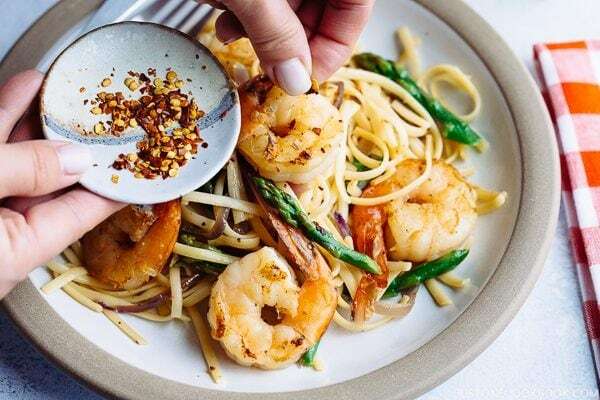 Fresh, spicy with the chili flakes and with a deep depth from the asparagus and shrimp. Such a wonderful recipe! ご馳走様! That’s a yummy and quick meal. Made this tonight with spaghetti noodles and scallops! Turned out amazing and I know I crushed it when my bfs eyes rolled back. Only took 30 minutes to prepare too! I’m definitely remembering this one for quick dinner nights when I get home late! Thanks so much. Looks delectable! Will definitely make this for dinner tomorrow! I haven’t yet tried a recipe from JOC that wasn’t delicious! Also tried your teriyaki chicken wings yesterday- so gooey and tasty! I unfortunately let it get a bit burnt… next time I need to keep a closer watch on it! But will definitely make it for friends coming over soon! Hi Faith! I’m so happy to hear you enjoy my recipes and thank you for your kind words!